With a variety of restaurant experiences under her belt, Liz Masnik decided to open her own restaurant and bar welcome to people of all different walks of life and lifestyle choices. At age 24, Liz began questioning what she really wanted to do with her life. The idea to open a bar and restaurant came to mind and she got to work. Two and half years later, The Borough opened it’s doors to the public. In May, The Borough will have been open for seven years. The Borough is located on 317 W. Morgan St. in Downtown Raleigh&apos;s Warehouse District. 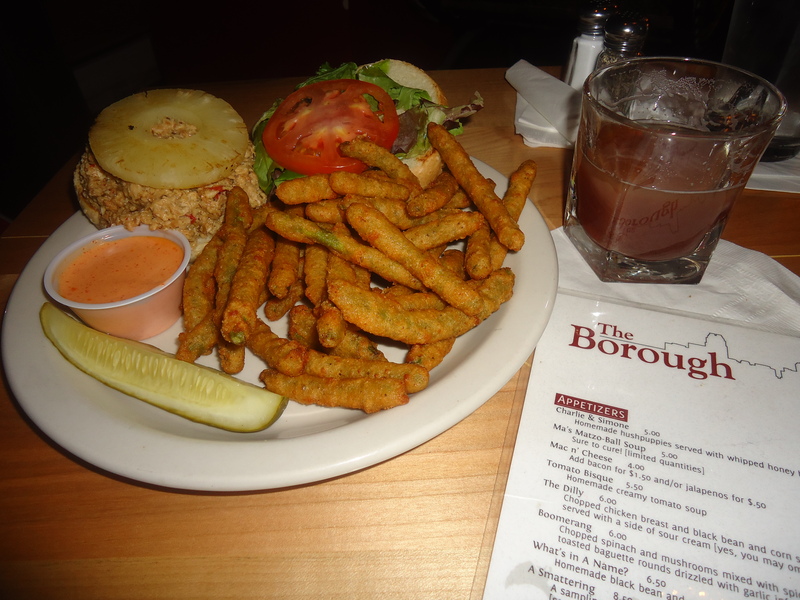 The Borough’s menu consists of eclectic pub food. Being a vegetarian for 20 years, Liz started The Borough as a friendly downtown neighborhood pub with a variety of vegetarian and vegan options. The kitchen is open daily at 4pm and serves food until the bar closes at 2am. Liz wanted a space with a bar atmosphere and built the kitchen around her menu concept. The Borough changes their menu as often as possible to keep things interesting and to satisfy the changing appetites of their clientele. Liz has seen a huge increase especially in the amount of vegans in Greater Raleigh and tries her hardest to accommodate people with all dietary needs at The Borough. Seriously though, you can even “veganize” your fries! Not only is The Borough known for its eclectic menu, but also the names of each item are quite imaginative. Most of the beverages and dishes are named after someone who works at the pub. Maranda, better known as “Da Funk” came up with Bring in ‘da Noise, which includes gin, red wine, red apple schnapps and cranberry juice served in a wine glass. You’ll get a kick out of reading all of the drink names on the menu. Some of my favorites were A Short Little Span of Attention, The Big Mama and Schmitty Schnapps. 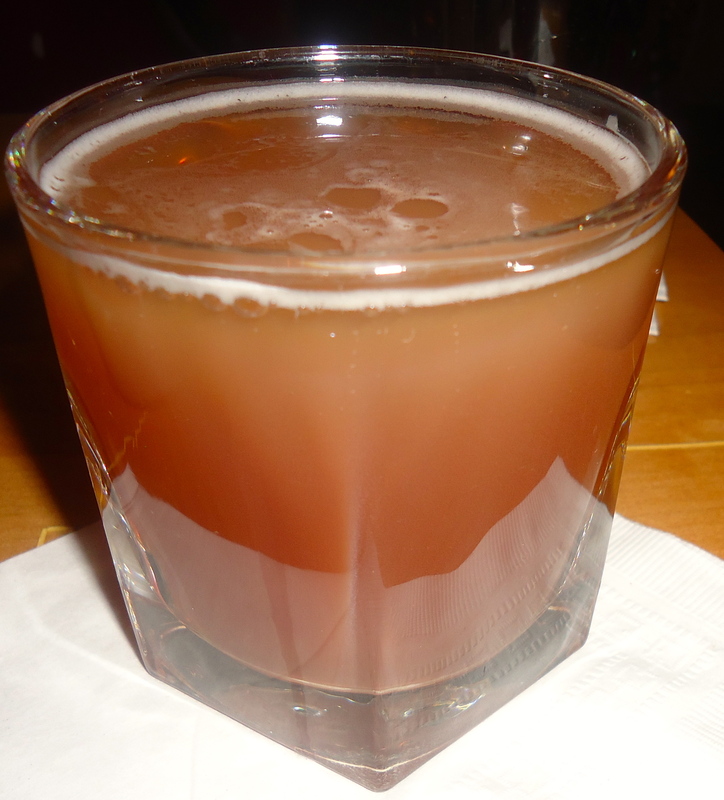 One of the most unique drinks made with beer was the P(om)BR on draft; a PBR draft beer with a splash of pomegranate juice. Pure genius! Liz’s favorite dish at The Borough is the potato corn jalapeno chowder, which will be featured on the winter menu debuting on MonShe also enjoys the Blackbeard Burger. The Borough’s homemade vegetarian black bean burger is topped with jack cheese, fried onions and sautéed mushrooms, served open-faced on a baguette with a side of special sauce. This delicious burger can easily be made vegan by requesting the dish without cheese. You’ll find that most of the vegetarian dishes at The Borough can easily accommodate vegan customers. For instance, you can take the bacon off the Love Me Tender, a peanut butter, banana and bacon sandwich on grilled sourdough. A crowd favorite at The Borough is the Überwisconsin, which includes sharp cheddar, jack, provolone and tomato grilled on sourdough bread. This cheesy sandwich has been on the menu since the beginning. The best part about the entrée is that you are free to add whatever you’d like; avocado, bacon, a spinach patty, or a black bean burger patty, you name it and you got it! Now if that isn&apos;t "easy" enough for you, a vegetarian favorite is the It’s Easier Thank You Think, a vegetarian spinach burger mixed with chopped red peppers, onions and garlic topped with jack cheese and sautéed onions on a toasted bun. 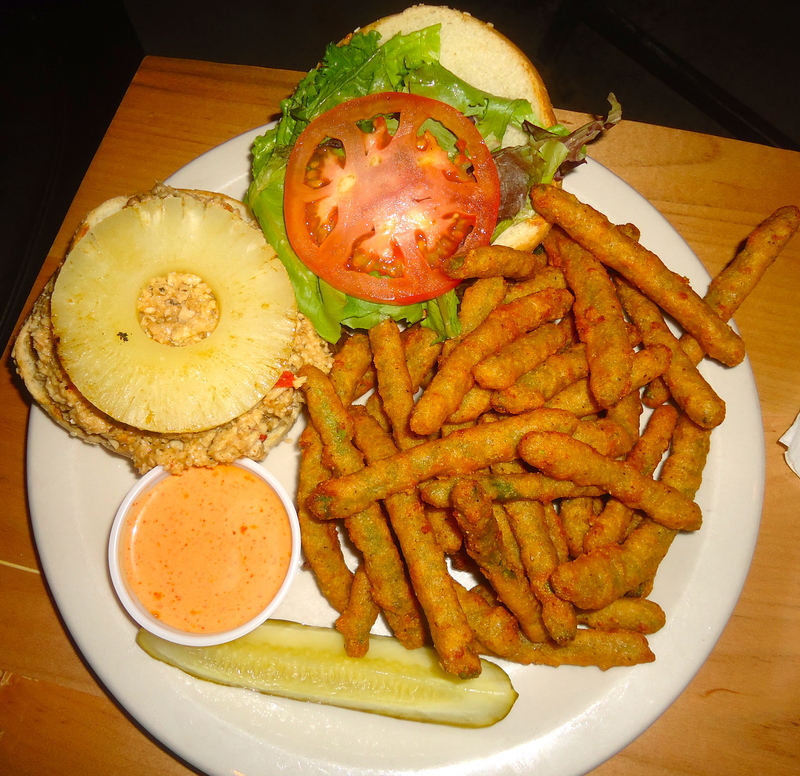 One vegan dish not to miss on the pub’s menu is the Steve Martin in his Greatest Roll. Sander Kedich is The Borough’s culinary school trained chef. He’s a “meat and potatoes” guy, which you’d never guess because he makes some of the most incredible vegan food in Raleigh. He was able transform mock chicken meat into a delicious entrée with an overwhelming variety of flavor combinations. Vegan jerk seasoned mock chicken meat topped with pineapple and served on a toasted bun? Yes, please. I’d definitely have another one of these sandwiches anytime! I also tried the fried green beans with Sriracha mayonnaise. Let’s just say these perfectly battered green beans are quite addicting and I wouldn’t want to share. I’d imagine at 2am and after a few beers these crispy pieces of pure bliss are even more delicious.